As I don't have enough to do already, I tried to make this recipe for the daring cook challenge. For the very first Daring Cooks' challenge, Lis of La Mia Cucina and Ivonne of Cream Puffs in Venice, chose a recipe from The Zuni Café Cookbook by Judy Rodgers to make Ricotta Gnocchi. I have heard many things regarding these gnocchi, mostly raving about their amazing texture, so I was really looking forward to trying this recipe. I have learned few things today though. First, don't wait until the last possible day as things can go wrong, even to veteran cooks, second, have a plan B. Since I had some home made ricotta in the fridge, made using the super simple recipe I got here, I forged ahead thinking it would be a piece of cake. The ricotta had already been drained for a while so I didn't think twice about using it. After I added the rest of the ingredients, including nutmeg and lemon zest, I realized in horror that the mixture looked way too wet. Not having time to make more ricotta nor to shop, I decided to try and add some flour to the dough. I tested the resulting, thicker dough, but the gnocchi fell apart! More flour was added, and the end result was....aheam.... pretty bad. I decided to post this anyway as a warning to others, the ricotta needs to be super dry for these gnocchi to work, not just drained, squeezed to death dry. I will try again because the flavor and the consistency of the first gnocchi, the ones that fell apart, were pretty amazing. 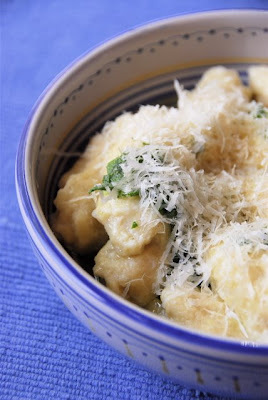 Click here for the recipe, and here to see a video on how to shape the gnocchi. Beautiful! soft pillows of goodness! 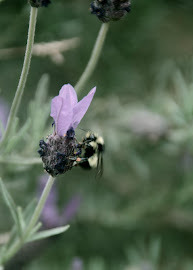 ssshhh... they loog good nevertheless!! And I love the picture! I had to drain the gnocchi for about 24 hours to get it to even a semi-dry state, so dry to death is probably right! Great job! That dish looks fantastic! Sorry, that was not well. I drained my ricotta for 3 days. I hope you try again because it was really delicious! I was sorely tempted to join the Daring Cooks, but decided one task a month was more than enough for me. 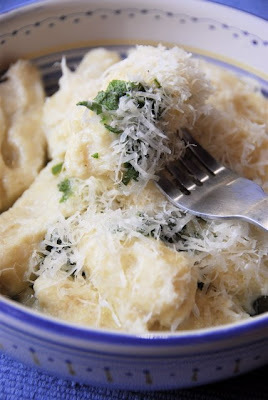 Ricotta gnocchi sounds fab though. Your gnocchi look fabulous against the blue! Seems like the key to this recipe is dry ricotta. Mmm, your gnocchi look amazing!! Thank you everyone for your comments. 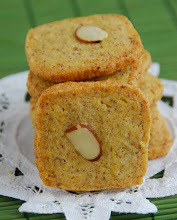 I will give this recipe another try, I know they are going to be awesome if I do it right. Yum Yum! I love gnocchi and ricotta. What a lovely dish.